This is the third and final paper from Fosway’s original series analysing the future of learning and the impact of e-learning on organisations at the turn of the century. It explores the different types of content that were available at the time, but also takes an early look at content management and delivery, as well as exploring e-learning standards. The series culminates with a practical roadmap for actually implementing e-learning – from proof of concept through to post project reviews and evaluating the effectivness of solutions in the workplace. Course and learning content comes in many forms. Currently this is the most fragmented part of the market with many products and many types of content. The natural assumption when considering e-learning is that content consists of computer interactive media. Actually this is probably not the case, with the bulk of content currently being used to support online learning being document-based. Much of this is re-purposed classroom training materials or existing word processing documents or presentations. Some of this material has simply been translated into HTML. In addition to the legacy content, there is of course newer content including web media, interactive media, video, audio and so on. Interactive content includes content originally delivered as CBT courses, as well as specially delivered interactive learning objects, created using Flash or HTML. Video and audio can be attached, downloaded and played or streamed. Document-based content probably represents the bulk of historical content and may still have an important role to play in an e-learning solution. Many of the learning models need a variety of supporting content, and document-based content is often the most available and descriptive material. Whilst it may be appropriate to redevelop some of this material into more interactive media, other materials are still likely to be relevant in their original form. When considering redeveloping materials, individual learning styles and objectives need to be considered. It may be easier for many of the learners to get answers through searching documents, rather than going through a structured click-and-turn approach. Given the size of video files, the technical decision about how they are delivered to the user is critical. If delivering to a web browser it is unlikely to be feasible to download video data unless it is either a) very short, b) already on the user’s file system (and launched locally), or c) streamed. Streaming video can still take significant bandwidth and needs to be carefully considered – even on a corporate intranet. Given many e-learning projects are delivering to a distributed audience, the problem of distribution management can also become very significant. Specific media types such as video or audio may also require special delivery servers which need to be integrated into content repositories or into the Learning Delivery Environment. • Specialist Protocols and Tools e.g. video (H.323), NetMeeting, Synchronous (T.120) etc. Consideration these requirements is important when determining a potential e-learning technology solution. Network bandwidth is always identified as a significant concern when evaluating a proposed approach. But scalability of the solution including server platforms, database sizes and content distribution are also key factors. E-learning, like almost every other technology-related issue these days, has a number of evolving standards which are relevant. Historically the most common specific learning standards are the AICC standards for interaction with CBT. The AICC (Aviation Industry CBT Committee) developed guidelines for the aviation industry in the development, delivery, and evaluation of CBT and related training technologies. The objectives of these were to improve the effectiveness and interoperability of CBT. The AICC has developed a number of AICC Guidelines and Recommendations (AGRs) covering a range of topics including interaction between CMIs (Computer Managed Instruction) and CBT content, and standard navigation for students of CBT. For more information see www.aicc.org. • The IMS learner profiles specification, which will look at ways to organise learner information so that learning systems can be more responsive to the specific needs of each user. These specifications have already received a high degree of market interest and many e-learning product and content vendors are intending compliance for future releases of their products. For more information see www.imsproject.org. ADL is a program from the US Department of Defense and the White House Office of Science and Technology, to develop guidelines needed for large-scale development and implementation of efficient and effective distributed learning. It is a forum which provides requirements input into the IMS specification process. See www.adlnet.org. This is a European Union project focusing on the development of tools and methodologies for producing, managing, and reusing computer-based pedagogical elements and telematics-supported training curricula. To this end, they are involved in related technical specifications efforts, most notably in the area of metadata. As part of a memorandum of understanding, ARIADNE and IMS have jointly developed a meta-data specification for submission to the IEEE. See ariadne.unil.ch. Hopefully this will have answered many of your specific questions when considering e-learning for your organisation. However, there is a big difference between looking at these issues to solve a specific e-learning problem, and in developing an approach that works in the generic, across many or all of your learning needs. This section focuses on the generic; developing an e-learning strategy that will allow you to meet many learning requirements. In ‘The Future Of Learning’ paper, we discussed understanding specific learning requirements and mapping to learning models which can help structure a viable e-learning approach. This approach and the associated guide to the relative roles of structure, content, participation and instruction/facilitation also help define requirements of the tools and technology needed to deliver the e-Learning requirement (particularly the Learning Delivery Environment). In order to create a strategic approach to e-learning within an organisation we now need to aggregate these differing requirements with their different recommended approaches. We need to be able to develop an e-learning environment, infrastructure and processes that can be used to support a broad range of e-learning needs and approaches, and flexibly provide the appropriate tools to deliver them. We call this aggregated environment an Enterprise E-learning Architecture and the aggregated e-learning provision is often now referred to as a Corporate University. Formal discussion of Corporate Universities is outside the scope of this document, but in considering the development of a strategic environment for e-learning, development of a Corporate University is clearly a relevant discussion. 2. Those services needed to support the complete range of learning requirements within the corporation. As outlined in the E-learning Technology Framework diagram. The portal is almost by definition a singular centralised environment, accessed across the corporate Intranet. Because it includes organisation–specific learning, and needs to be integrated into other corporate systems it will tend to be an internal portal (as defined previously). 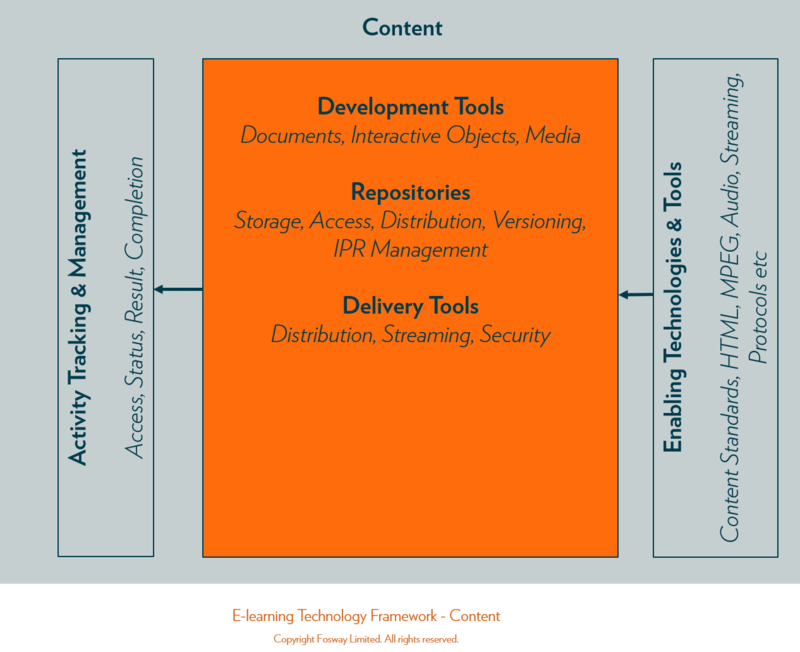 Therefore, the ELA needs to contain a set of tools which are sufficiently integrated to be an aggregated e-learning service, but sufficiently powerful to meet learning needs and the learning techniques defined by their associated learning model. The solution is highly unlikely to be a single product, but could consist of a small number of core products that can be flexibly applied. Whilst the portal is by definition centralised, e-learning is by definition decentralised, happening from wherever the learner is. With the likely need in any large company to deal with remote staff and distributed offices, the ELA has to be able to operate in a similar distributed environment. In one of our examples earlier in the document, our field sales organisation needed to be integrated into the e-learning process anytime anyplace. As well as from the office and from home, we most importantly want to be able engage them when they are on the road, using laptops in hotels and airports. Until we have unlimited virtually free access to the Internet in these environments, a process of managing disconnected use in these circumstances would seem to be a necessity. The management and distribution of content to a large distributed audience becomes paramount. It is one thing for individual course content to be accessed via a URL or from the network, but how do we manage when we have thousands of content objects or documents? How do we control distribution of the content across many offices with restricted communications between them? We are all aware of the restrictive nature of corporate network bandwidth. Add to this distribution to remote and mobile users, and disconnected access and we have a significant challenge. • A viable approach to content management and distribution across a large and distributed infrastructure including connected and disconnected use. Developing an understanding of where and how e-learning can be applied in your context is an obvious starting point. An opportunity review could be ‘strategic’, in other words, look for opportunities across the range of learning within the organisation, or be more focused on a specific area, department or need. The review typically mixes together face-to-face workshops and interviews, and on-line collaborative processes. The outcome from the review is a prioritised list of prospective e-Learning applications ready for detailed analysis and planning. Having identified one or a number of specific target areas for e-Learning, the next logical step is generally to progress into some form of Pilot. However, for some organisations it is sometimes necessary to take an interim step in order to secure Senior Management sponsorship for the pilot. This proof of concept step is an organisational-specific demonstrator of the potential application area, developed to make the concept more tangible and easier to sell internally. This demonstrator can be used to gain commitment and funding, and support an internal communications process. By being specific to an organisation it avoids problems of ‘not applicable to us’. Assuming commitment has been gained to progress, the next stage is to define and plan proposed pilots in more detail. This planning process needs to include a more detailed analysis of the learning requirements and mapping to learning models. It should also identify the value and risks of each proposed pilot. The detailed planning then enables proper qualification of each proposed pilot. This process can be fast-tracked through the use of standard templates and tools. Having qualified potential pilots, we need to determine priorities and whether multiple pilots are appropriate. Multiple parallel pilots are generally a better approach if an organisation is developing a strategic approach to e-learning rather than solving a specific learning requirement. Multiple pilots enable us to diversify risk and prove different kinds of value, such as reduced cost for one and learning enhancement for another. Multiple pilots also force us to develop common approaches to infrastructure and core learning support processes. Pilot implementations should be run as discrete projects. The critical success factors identified in ‘The Future of Learning’ paper should be considered in-depth and each pilot project needs to be properly managed and executed. If multiple pilots are being developed in parallel, there may well be a common infrastructure or learning support component which will increase efficiency, but the organisation must be capable of supporting and managing parallel projects as well as the inevitable rework associated with any pilot process. A pilot is completed when the learning process has been completed, not when the ‘course’ has been developed. It is not uncommon to find an initial plan that focuses on content development and application implementation, missing off the actual learning activity – having students finish the course and evaluating the results in basic terms. Depending on the specific circumstances, an e-learning strategy can be developed in parallel to piloting or follow it. We tend to prefer a more parallel approach as it allows a strategic plan and a business plan to be prepared in parallel to the actual act of proving it works. The plan and the evidence can then be presented together. An e-learning strategy needs to define the broader approach and model within an organisation. Some of the strategy may have already been defined, but experience from pilots plus a deeper understanding of the potential, requirements and issues will result in an evolving approach. The strategy must include a strategic business or justification. Note: If the organisation is developing a Corporate University this plan will need to be far more extensive and incorporate much more in the way of business and organisational content. One outcome of the strategic plan should be the definition of needs and requirements which can be input into the process to define the strategic e-learning technology platform, the Enterprise E-learning Architecture. The architecture needs to be capable of supporting the defined e-learning needs and be flexible enough to evolve to support future needs. This latter statement may be simple, but has huge implications. Predicting future requirements is obviously challenging, but throwing away an architecture is unlikely to be an option, so getting it right first time is important. Hence the focus in the previous steps on understanding the broader requirements. Another key factor in determining a proposed architecture is the broader technology context within an organisation. IT strategies in terms of networking, operating systems, databases, application tools, vendor choices, the use of the Internet etc. all have a significant bearing on the shape and nature of a proposed architecture. Vendor strategies also have a major effect on potential products chosen. We are now down to the strategic implementation project. Given the likely scale of the project, with large service development, content development, infrastructure development and organisational development components, the strategic implementation needs to be managed as a programme, with many defined subprojects and steps. As with early stages, we must ensure we focus on organisational and service development as well technology and content. Experience indicates in spite of the technology challenges, the people and service issues are often the killers. A strategic implementation programme will typically consist of a number of key stages or phases of its own. The programme is likely to stretch over a duration of two to five years, and involve many members of staff as well as external resources. A complete life-cycle is required. Implementation is not the end of the process. As well as evolving business and learning requirements, technology and organisation are also moving targets. Evaluating current e-learning activities, outcomes and strategies allows for a more objective measure of real effectiveness and potential for further development. The areas reviewed could include strategy, organisation, architecture or services or any other relevant parts of the process. Bandwidth will continue to increase to allow more media-rich and interactive content to be delivered (e.g.synchronous streamed video and complex simulations). However, as users become ever more demanding, the debate on whether there will ever be enough bandwidth will remain to be seen. The wireless WAP enabled device age should mean that we will be able to access e-learning content anywhere we can take our mobile devices.